Two longtime Rochester journalists were inducted into the New York State Broadcasters Association Hall of Fame on Thursday. 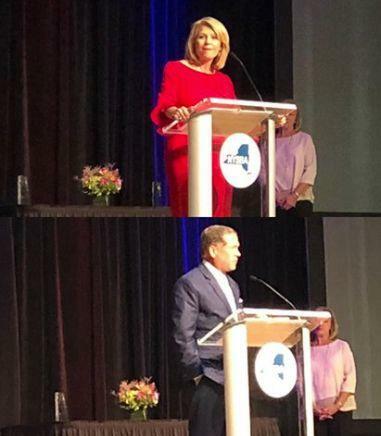 Anchors and reporters Ginny Ryan and Doug Emblidge, both of 13-WHAM TV were inducted during a ceremony in New York City. Ryan told us that the award is really about not just her accomplishments but a lot of people she’s worked with along the way. "For me it really reflects everyone I’ve ever worked with, anyone who’s ever watched and anyone who’s ever said yes to an interview, because without all of them, I wouldn’t be having a place in the Hall of Fame," Ryan said. Emblidge hopes an award like this spurs him to continue to push for good journalism and help the reporters who are involved in that effort. “It’s really kind of a challenge to take stock and do more and maybe be an example if you can for others who are coming along in this field , which gets more challenging every day," Emblidge told us. The Hall of Fame inductees also included New York Yankees announcer Michael Kay, Dave Davis of WABC-TV in New York City, and iconic New York DJ Dan Ingram. ABC’s World News Tonight anchor David Muir as selected by the association as Broadcaster of the Year.